﻿ Melling Cylinder Sleeves, Manufactures centrifugal cast iron cylinder liners to tolerances as small as one half of one thousandth of an inch, on modern CNC equipment. Our centerless OD grinding process guarantees a part that is perfectly round and to exact size specifications. The material used in Melling cylinder liners offers a Brinell hardness of 241-293, and machines easily with strength and durability similar to that of ductile iron. 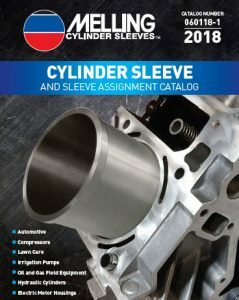 Melling Cylinder Sleeves stocks sleeves for a wide range of the most popular automotive applications, as well as sleeves for compressors, lawn care equipment, agricultural applications, and oil field equipment. Melling Cylinder Sleeves offers liners with a broad range of bore diameters, starting as small as 2” up to a very large 8.50” bore, and finished lengths ranging from 1/8” up to 24”. Sleeves are available in 3/32” and 1/8” wall for bore diameters up to 5-1/8”. Bore diameters larger than 5-1/8” are stocked only with 1/8” wall thickness. Melling Cylinder Sleeves also offers 1/16” and 2mm wall thickness’ for limited applications. Melling Cylinder Sleeves can also make sleeves for custom applications. If you don’t see what you are looking for in our catalog give us a call. Low volume, high volume, honed or semi-finished it doesn’t matter we do it all. Melling Cylinder Sleeves can make a sleeve to your exact specifications and in less time than you think. Make sure to enter all appropriate dimensional information on the supplied templates. Melling Cylinder Sleeves will quote pricing and lead times by return fax or email. Download catalog now or sign up to receive the Melling Cylinder Sleeve Catalog by mail.